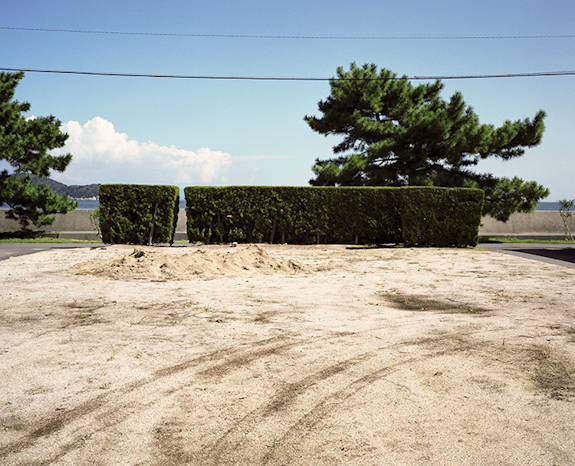 This ongoing body of work is an exploration of the peripheral, the insignificant and sometimes monumental spaces within the Inland Seto Sea islands in southern Japan. I’m drawn to intersections of public and private, natural and the built environment, literal and metaphorical boundaries that offer protection as well as isolation. Acknowledging that place suggests an experiential encounter and space points to the unknown, these images invoke the dichotomy of an intimate encounter against the distanced backdrop of foreign observation. They are, in one sense, more about the act of looking than a narrative about place. Though they involve a detailed transcription of place, they operate within the perpetually-passing, moment–ambiguous fragments of the material world. The title of this series, Borrowed Views, is loosely based on shakkei (borrowed scenery/views), a stylized perspective strategy used in traditional Eastern landscape painting and 17th-century Japanese garden design. In the former, vistas are overlaid to influence the way the eye perceives near, middle and far distance; in the latter, a nearby landscape monument is framed within the garden to create a meticulously-constructed focal point. Referencing a conscious manipulation of the natural world, these images evoke both real and imagined thresholds and boundaries, and refer back to the mediated construction of reality within the photograph.